Good morning! Are you looking for a great Father's Day gift? Or for ideas for scrapbooking the men in your life? 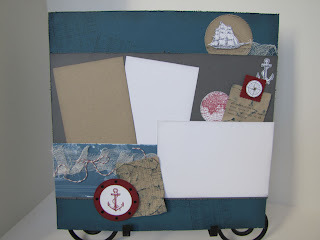 Have you seen this months Stamped Treasures Scrapbook kit? It's perfect to celebrate the men in your life or scrapbooking those favorite holiday photos. This months kit has a very vintage feel, everything is distressed, wrinkled and torn. The mini album is a 5"x7-1/2" multi media album, bound using binder rings. And the 12x12 scrapbook layout is amazing. I can't wait to add some of my favorite photos to this layout! Stamped Treasures Scrapbook Kit includes all the precut supplies, punched and Big Shot shapes (no stamped images) and are available to anyone across Canada. Cost is $24.95 if you are local and would like to pick it up or $34.95 shipped. Order your kit today using the Paypal link found here. Stamped Treasures Scrapbook pdf includes step-by-step instructions emailed to you. Instructions include a list of supplies, and photos to help you through the process. This option is available world wide. PDF file will be emailed within 24 hours of receipt of payment. Note: I will be have irregular internet access from May 20th to 27th. It may take a little longer than the 24 hours to email out the pdf. I will do my best to get it to you as soon as possible. Order your pdf file today using the Paypal link found here. Remember that these projects can be created using any of the supplies you have on hand.